That principle is: Your MENTAL concentration and attitude can DEFINITELY, POSITIVELY influence your PHYSICAL BODY'S response to exercise - a proven fact. "When thought is directed to the movement of any muscle, the development of that muscle is accentuated in consequence. "If a man determines to develop, for instance, a biceps muscle and simply fulfills the exercises prescribed by working that muscle according to directions given, his mind being on other things, the muscle does not develop so rapidly as if he concentrated his attention on that muscle. "This principle applied to the exercise of the system that you are learning is of the utmost importance. When practicing prescribed exercises, concentrate your mind upon the operation. "You will not only develop strength and flexibility of the member more rapidly, but the after-effects will be more certain." The above principle is essential, it DOES truly work, and it's of such importance to the COWLING SYSTEM that it is written into each of the Cowling System of Hand Strengthening Exercise's instructions. Let's say you were trying to thread a needle, a normal CONSCIOUS activity. If you don't want to spend all day threading a needle, you LOOK at the thread and the needle and pay attention to what you are doing so as to get the thread into and through that eye of that needle. There is no need or use for anything else mentally associated with "threading a needle", except THREADING THE NEEDLE itself! THIS is the kind of concentration and attention we are using when we do The Cowling System. 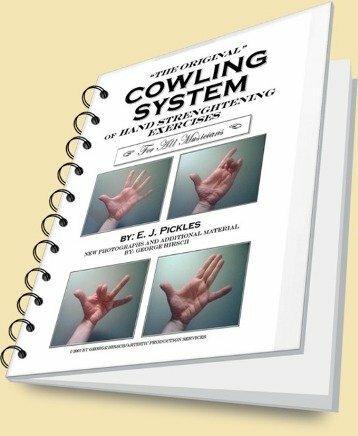 Therefore The Cowling System's hand strengthening exercises are best done in a place where there are no distractions or interruptions - Where you can put your mind completely on what you are doing. Then they produce full and rapid effect. "I can attack difficult pieces and play them in a way I never dreamed of. They are invaluable, and worth a great deal more that the fee charged"
~ From "The Violinist" magazine, December, 1924! Click the secure button below to obtain an INSTANT DOWNLOAD of this book in pdf format with FULL COLOR photographs for only $22.50! Read about the basics of the Cowling System, and in what way playing an instrument is an ATHLETIC activity. What is the RIGHT type of exercise for the musician's hands? The WRONG type could be damaging. Find out more. At what point does technique and the instrument "disappear"? The Cowling System can help get you to that point. Basics of the Cowling System ©: Playing an instrument is an ATHLETIC activity. What is the RIGHT type of hand strengthening exercises for the musician? The WRONG type COULD damage your hands! Can the MIND influence PHYSICAL exercise? - YES!